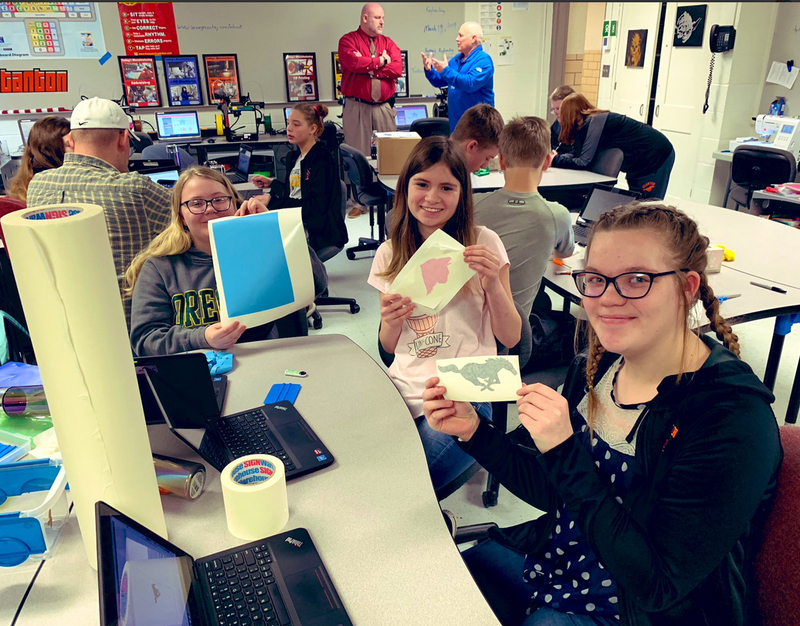 Made in Stanton: Nucor's makerspace opening eyes and doors for students | Nebraska Public School Advantage - The power of public education. Sometimes, tiptoeing around the obvious truth is hardly worth the trouble. So, when it comes to middle school keyboarding, Stanton Community Schools Technology Coordinator Rick Spotanski comes clean. His other courses, Digital Media and PC Maintenance and Repair, are anything but mundane. Keyboarding, however, for as important of a skill as it is, doesn’t naturally inspire the same levels of enthusiasm. The sound of finger pushing key is, in itself, nap-inducing. How many quick brown foxes can jump over lazy dogs before attention fades? That used to be the question. And, if you've been in a keyboarding class, you know the answer is NOT VERY MANY. 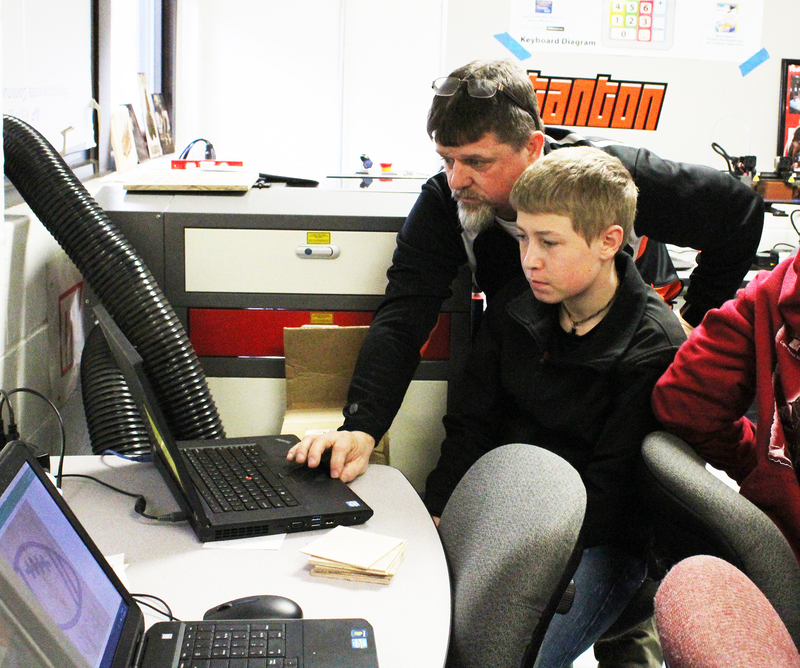 But then, Stanton teamed up with Norfolk-based detailing center Nucor and Spotanski’s middle school classroom received an invigoration of high-tech equipment. A mobile makerspace, complete with computers, 3D printers and scanners, vinyl cutters, a laser cutter and engraver, and CNC machines, now rotates between Stanton, Pierce, Battle Creek and Madison. A stationary lab at Norfolk Middle School is also in place as result of the $125,000 Developing Youth Talent Initiative Grant that was awarded to Nucor last summer. So, yeah, you could say Spotanski’s students tap out sentences with a little more pizzazz these days, what with all those machines waiting to be utilized. What was once a middle school keyboarding class has been transformed into a world of creative possibilities. Behavior problems have all but vanished. Students want to be working. They’re invested in their projects and they’re having fun. “It makes life in the classroom a whole lot easier,” Spotanski said. All the while, students at Stanton and the four other locations are having their eyes opened to the world of skills and trades, and the careers waiting to be filled in that world, at a younger age than in years past. “The more opportunities we can expose our kids to now, the more opportunities they are going to be able to find when they do graduate and move on, whether they end up in school in Omaha or at Northeast CC, or walking directly into the job field,” said Spotanski. Student opportunity is a priority at Stanton. It’s one of the first things that stands out about the place. On this Tuesday morning, Spotanski’s classroom bustles with a combination of zeal and zest as students navigate the quarters, making observative pit stops at each of the room’s several stations to check in on the progress of one project or another. This isn't your father's keyboarding class. This class is alive. 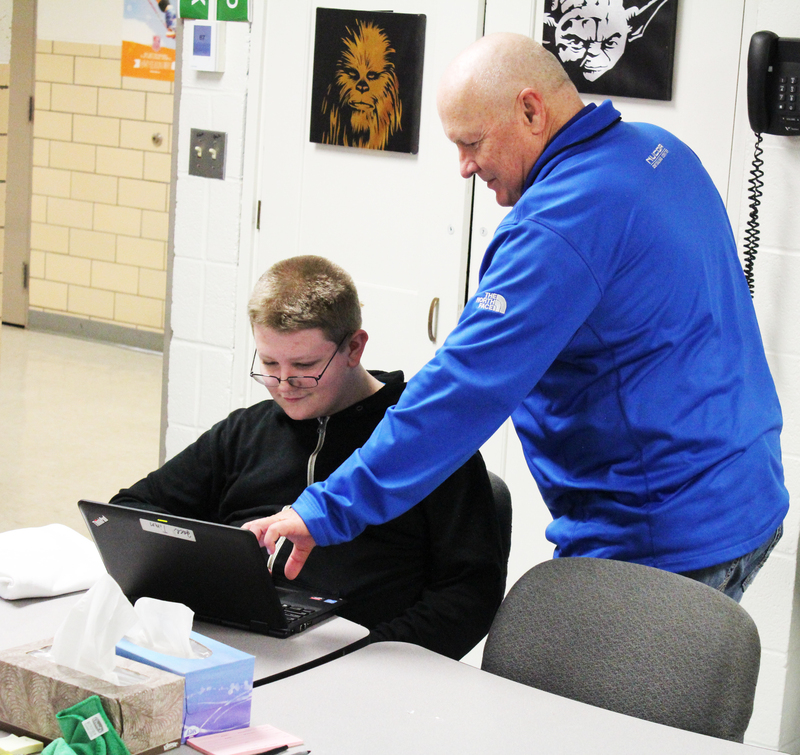 Nucor employees Dave Decarolis and Justin Olson assist the students with their projects. It seems as if they’ve formed a relationship with each of them, the way they know their first names and the details of what each kid is working on. In years past, Nucor would visit schools to speak with seniors. Looking back, those stops weren’t as productive as this Tuesday morning in Stanton. Nucor began researching the grant. The more they read about its possibilities, the more excited the company grew. When Stanton Community Schools were approached by Nucor, there was no hesitancy. If it was good for the students, then they were all on board. Decarolis wishes more school districts were aware of the Developing Talent Initiative Grant. If they were, he knows they’d utilize it in special ways. Maybe it’d be visual reality welding for young students. Perhaps it’d be website development. It’s really up to administrators to shape the program into what best fits in their respective districts. The partnership is mutually beneficial, too. Nucor, for example, should see more skilled workers eight years down the road as a result of their current investment in area youth. For Olson, it’s been fascinating to watch the kids engulf themselves in the technology. Young people are already tech savvy, we all know that, but he's seeing them apply that instinct to outlets other than their cell phones. And, frankly, it’s a blast to witness. Dream up an idea. Lay out a plan. Execute the plan. Sell the product. Eventually, each of Nucor’s partner schools will have similar stations in their own buildings 100-percent of the time. The current equipment is designed to rotate. One month in Stanton, the next in Madison, and then off to Battle Creek and Pierce. Eventually, it comes back. The students and staff eagerly await. While schools work to make the programs permanent, Nucor intends to be there every step of the way. Like the districts they’re working with, they have a commitment to the futures of these kids. In the future of Nebraska. The impact to the industry might not be felt tomorrow, but it’s coming. Last fall, business teacher and FBLA adviser Karla Renn took some of her high school kids to check out the Nucor equipment. Maybe they could do a few small personal projects of their own, she thought. The equipment was there, so might as well take a crack at it. Then students started working with the machinery, and she saw an unfamiliar spark. All of a sudden, a classroom had been rejuvenated by the prospect of working hands-on, and a teacher enlivened by the different ways she could incorporate this newfound resource into every day curriculum. Each year, Renn's entrepreneurship class is tasked with writing a business plan, a difficult ask in years past. Especially when the businesses were hypothetical and the products totally made up. Now, thanks to an embroidery machine from A to Z Vac N Sew in Norfolk and a willingness to explore outside of the proverbial box, her students are showing a fire she’s never before seen in the classroom. 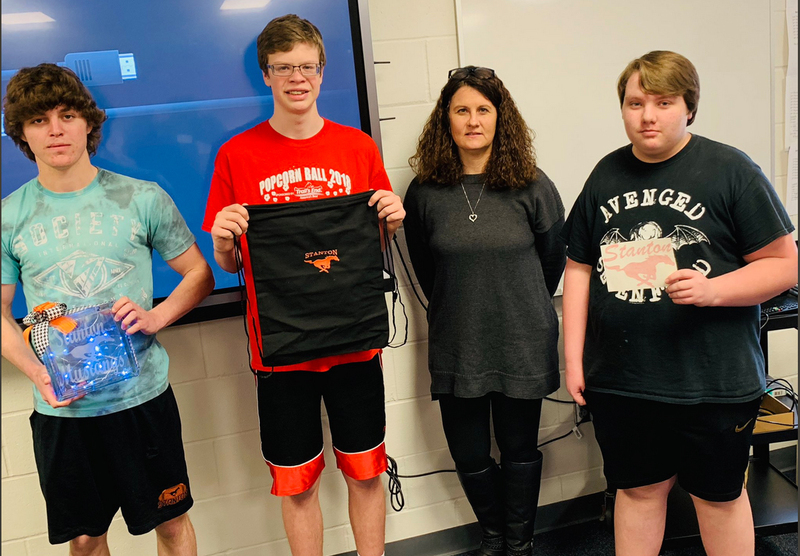 Renn’s students have completed products that benefit the school, such as embroidered backpacks for the girls basketball team (an assistant coach, she likes to see that) and vinyl stickers and signage for the gymnasium. 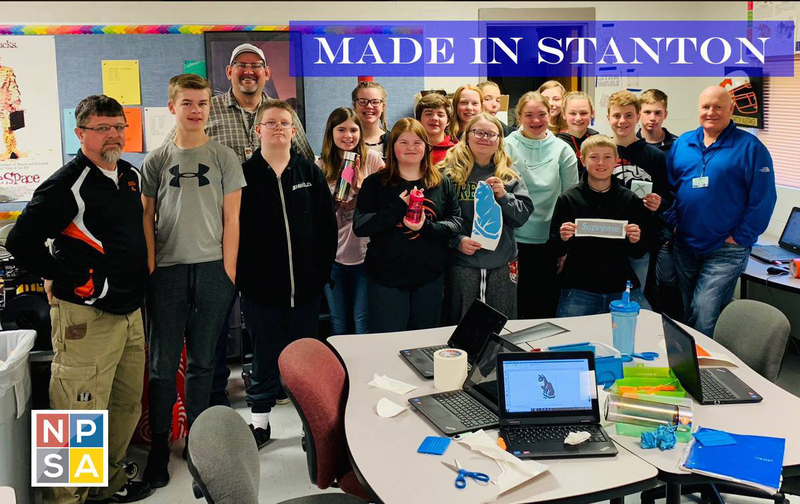 Essentially, they’re leaving a lasting mark on Stanton Community Schools through their work in the rotating makerspace and with the embroidering machine. For Nucor, it’s been entertaining to watch the different ways instructors in the area integrate the machinery into coursework. They’re not recreating the wheel. They’re just using the resources to enrich it. In the end, students ultimately benefit. Just like Spotanski, Renn is learning on the fly every day. She’s usually only a day or two ahead of her students. In other words, no day is ordinary. “The fact that, down the road, kids will be coming into the high school with previous experience is awesome,” Renn said. The district is evolving. So, too, are Stanton’s students. Before Renn could finish her sentence, the owners answered. Absolutely, they said. The end goal is to funnel skilled workers back into Northeast Nebraska and the surrounding region. To do it, schools like Stanton and educators like Spotanski have had to shift the way they teach. They’ve had to embrace the learning curve, explains Cunningham. Spotanski has been doing this for 24 years. He still can’t wait to wake up and go to work each morning. With all the new possibilities at Stanton Community Schools, he has a feeling his students are starting to feel the same.